﻿ Handy Library Manager, check kit out, check kit in. 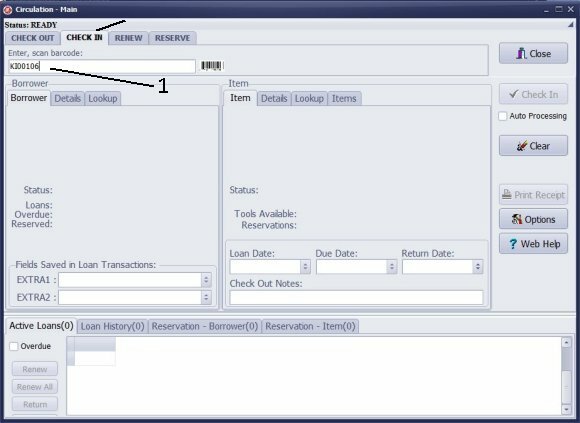 How to process kit loan, return transactions. 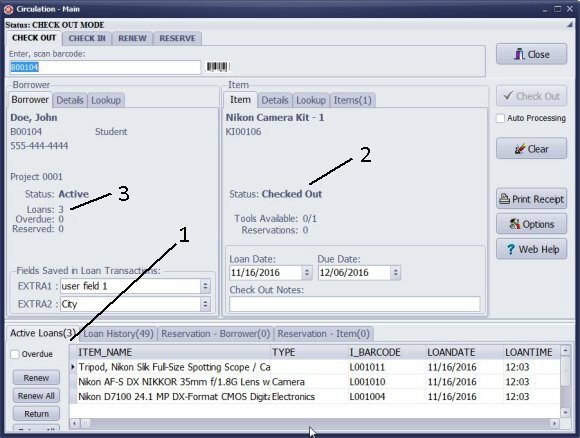 You have to use kit barcode numbers to process check in or check out transaction. If you don't use a barcode scanner you can enter numbers manually. Open the Check Out window. Scan or enter kit barcode number into the Barcode box. The kit is selected automatically or after Enter key is pressed (keyboard). 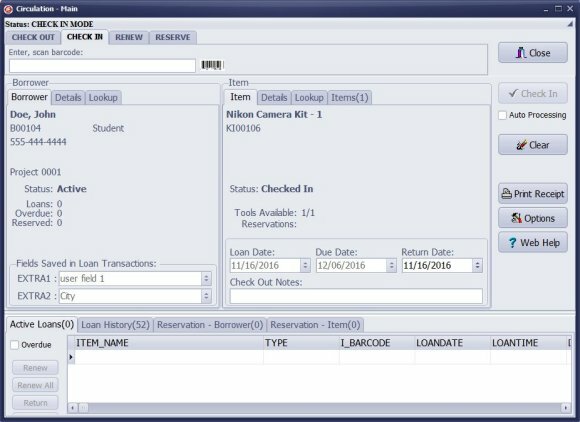 Use The Loan Kit (1) window to review: kit status, content, and status of items. The plus sign, at the front of the item, indicates that the item is in the kit (was not loaned out individually). The minus sign means item was checked out separately. (You are allowed to loan/return incomplete kits). 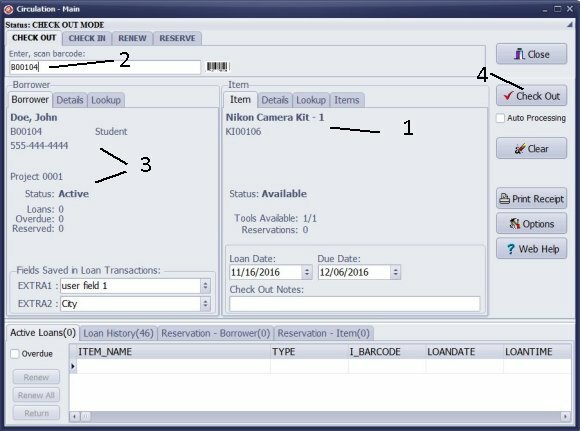 If you enter pictures for your inventory items, they are displayed in the Loan Kit window. It could speed up the kit verification process. 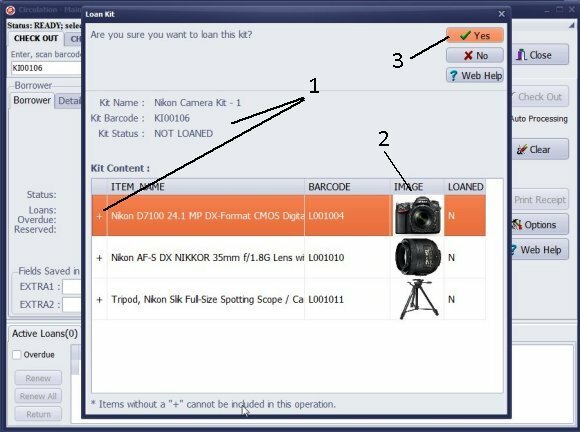 The Kit is selected; details are displayed in the Item section (1). Scan or enter the borrower barcode number into the Enter, scan barcode (2) box. 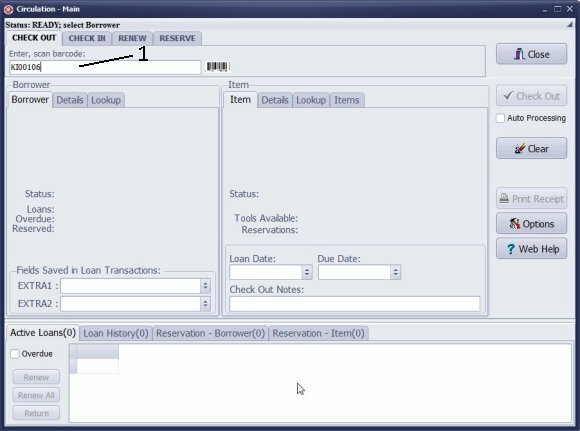 The borrower is selected automatically, or after Enter key is pressed (3). Click Check Out (4) to process the loan transaction. All items from the kit are added to the Active Loans (1) table. The Kit Status changes to Checked Out (2). The borrower's Loans (3) number increases by the number of items in the kit. Scan or enter kit barcode number into the Enter, scan barcode (1) box. The kit is selected automatically or after Enter key is pressed. 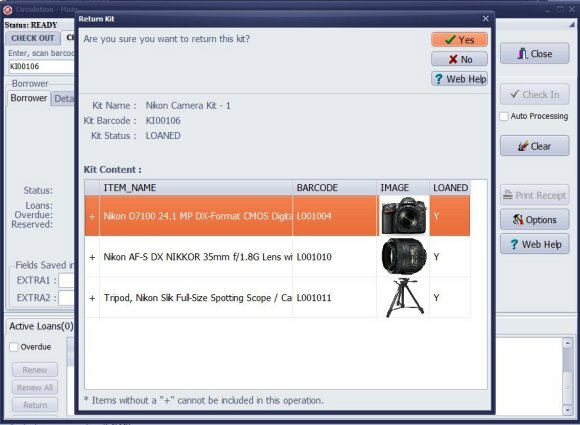 The checked in kit changes the Status value to Checked In, increases the Tools Available number by 1, and displays the Return Date. 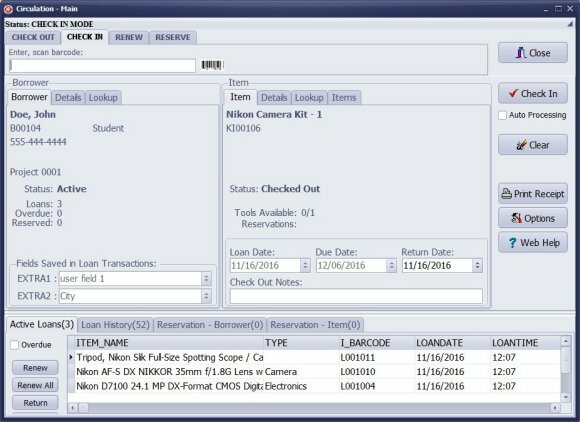 All returned items (from the kit) are removed from the Active Loans. The borrower's Loans number decreases by the number of items from the kit.